These rare small monkeys (16cm body + 20cm tail) have a silky, long fur, their round head is surrounded by a mane. The fur is shimmering yellowy greenish grey. Pygmy marmosets are mostly staying in the treetops. Because of their pointed claws, they are able to climb the trunks vertically. 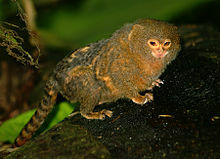 Pygmy marmosets are drilling small holes into the trees, to be able to drink the vegetable juice out of it (main food).